At the Heart of Hadrian's Wall, Roman Britain comes to life! As well as the Hadrian's Wall Trail, there are amazing Roman Forts such as Vindolanda and Housesteads, fantastic countryside and a wealth of accommodation too. Hadrian's Holiday Lodges have two garden lodges available throughout the year. They are located on the edge of the hamlet of Longbyre, in between Greenhead and Gilsland, at the western end of the Military Road, a picturesque route that runs parallel with Hadrian’s Wall, and just a few miles from some of the main attractions along the central section of the Wall. There are just two lodges - so you do feel like VIP guests - one with a double bed and the other with twin beds. They are set closeby each other in the garden of their home, but quite separate from their living and garden areas, and also not overlooked. Being close together makes them great for a family to book both at one time, however, they are completely sound proof so also ideal to just book one at a time. Make no mistake these are luxury – It’s definitely not camping. And more like the top end of glamping. Unlike much other wooden pod accommodation I’ve viewed on the internet these ones have very comfortable beds; both are en-suite with full shower room, toilet and basin with hot running water; they have soft furnishings and underfloor heating; fridge, microwave, kettle and toaster; and are kitted out for B&B with full bedding, towels, hairdryer and TV, table and chairs also inside the lodge. There is wifi but this wasn’t working that well while we were there, but they are working to resolve that. But I do have to say it was actually quite nice not to be attached to mobile devices and be able to relax and get away from it all. My boys haven’t stayed in a B&B before and it’s a couple of years since I have. Have to say though this is not like an ordinary B&B. It does feel like you are more independent than that, so all the best bits of self-catering, but then you have the treat of breakfast arriving, already prepared. Waking up to the sound of birds and sheep in the countryside was also magical, and open the door to the lodge or the blinds and you can see the sheep and newborn lambs in the field. The boys loved it, as did we, and want to go back. They also said it would easily win the ‘Four in a Bed’ TV programme. 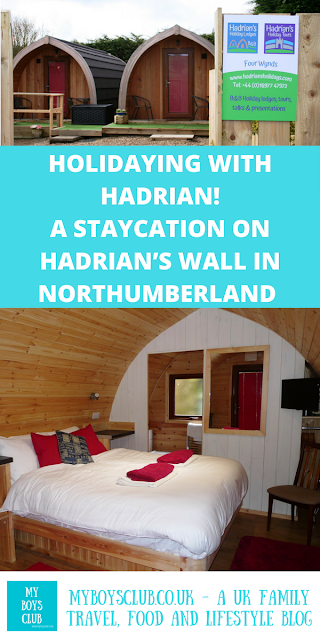 So if you are wondering where to stay on Hadrian's Wall then do check them out. The breakfasts at Hadrian's Holiday Lodges are cooked by Nigel Jarvis. A former deep-sea diver who lived and worked in Egypt for many years, he has now operated a B&B on Hadrian’s Wall for over 10 years with his wife Catherine, who he met in Egypt. The Four Wynds B&B has been one of the most popular and Nigel skills in the kitchen are evident at breakfast time – and in the evening when he delivers home made cake to his guests. The delicious breakfasts using organic, Fairtrade and locally sourced ingredients whenever possible and are served in the lodges at a time of the guests choosing. If you are peckish early you can start on the cereals and toast available in the room or just wait for your full English to arrive. The museli was particularly good. You can see how much space there is in the lodges as we all ate breakfast together in one lodge. A full English breakfast is available or a vegetarian alternative or you can choose the ingredients you like. One of our boys had sausage, bacon, scrambled eggs and tomato, and the other sausage, bacon and fried eggs. Me and hubby had the veggie version. All were delicious and we repeated our order for our breakfast on the second morning. The hospitality doesn’t end there though. Both Catherine & Nigel are a wealth of knowledge about the area. They know every place to dine out or where to buy a cup of coffee or even order a takeaway (or in our case order it for us!) – you are also able to bring back to the lodge to eat in comfort. They even put out plates and cutlery and come and clear away your dishes too. 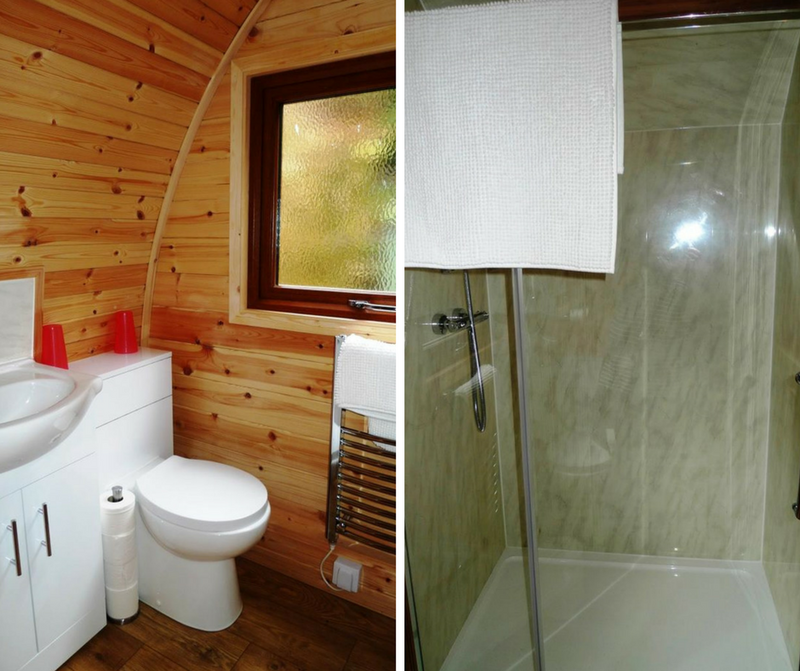 The lodges cost £75 per night per lodge which includes all amenities and breakfast. 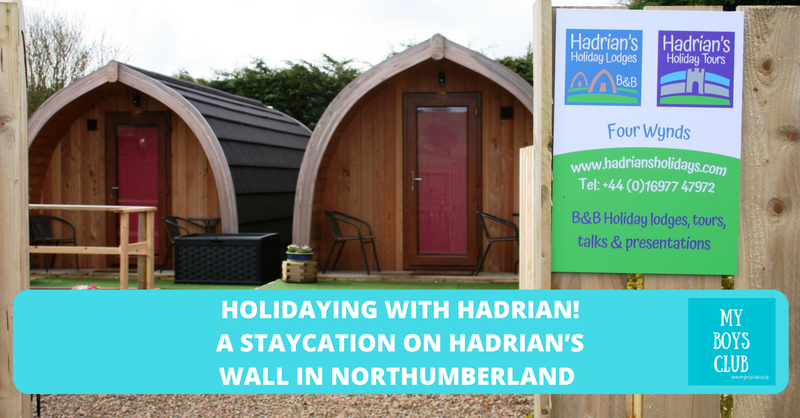 Catherine also offers bespoke and exclusive Hadrian’s Holiday Tours to guests at Hadrian's Holiday Lodges, around some of the fascinating Roman forts and fortifications in Northumberland, including Vindolanda, home to the famous writing tablets. Catherine qualified as a guide to the sites of Vindolanda and The Roman Army Museum, under a special two-year programme supervised by the Institute of Tourist Guiding, Hadrian’s Wall Heritage and The Vindolanda Trust. 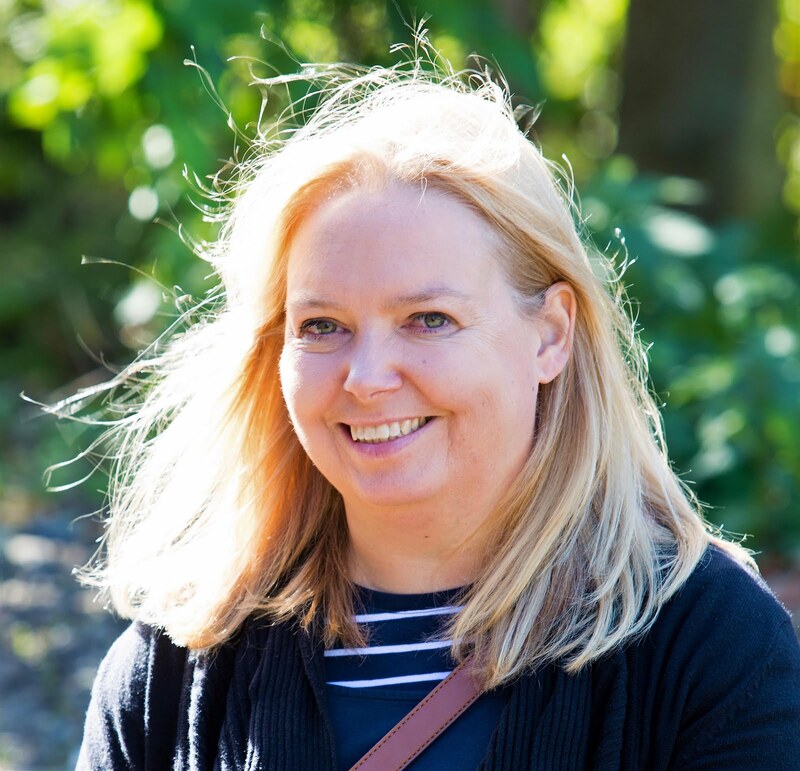 As well as a Yellow Badge Tourist Guide, Catherine is also an experienced linguist with an extensive knowledge of Roman history, so is your guide not only to the area but also the Latin language too. In fact, whether you are interested in the Border Reivers, Sir Walter Scott, Bonny Prince Charlie, or the exploits of the early archaeologists in the region, Catherine has something to offer you. You can find out how me and the boys’ found one of her tours to Vindolanda in a forthcoming blog post! As well as being close to the Wall, it’s is also nearby Wainwright's Pennine Journey and the Pennine Way; and the National Cycle Route 72 goes past the lodges and buses stop virtually outside. This makes the accommodation not only for perfect for families or small groups, who like us who want to spend a few days exploring the area but also walkers and cyclists too. There is also a train station in nearby Haltwhistle too. Spanning almost 80 miles coast to coast across Britain, for around three centuries, Hadrian’s Wall was a vibrant, multi-cultured frontier. Built by a force of 15,000 men in less than six years, it’s as astounding today for its sheer vision as it is for its engineering. Milecastles, barracks, ramparts and forts punctuate a diverse landscape that provides a dramatic backdrop. Visitors can explore bathhouses, turrets and shrines, visit galleries and museums and watch live excavations. 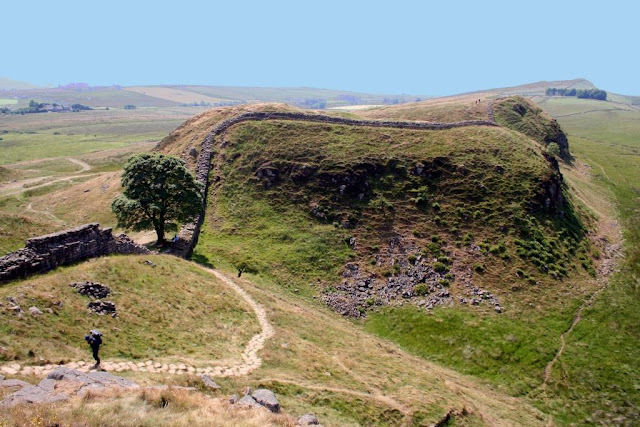 Hadrian’s Wall is a unique, must-see monument and a remarkable place to experience. Just within the central section, there are over 15 Roman sites to visit, some free, some paid for attractions including Housesteads, Chesters, Steel Rigg, Vindolanda and The Roman Army Museum. As well as Hadrian’s Wall there is so much more to see. As well as visiting Hadrian’s Wall sites of Vindolanda, Walltown Crags, Cawfields Quarry and The Roman Army Museum, during our short break we also visited Talkin Tarn, a local county park; Lanercost Priory – an English heritage property just a couple of miles away towards Brampton, climbed a mountain in the North Lakes – Cat Bells – which overlooks Derwent Water near Keswick; and followed the Border Reiver Trail through the Scottish Borders tracing the lives of my ancestors, the Armstrongs. In addition to nearby Haltwhistle, Carlisle is also close by just over the Cumbrian border with its Castle, Cathedral and museums, and Newcastle-on-Tyne is less than an hour away – named by Rough Guides as the place to visit in 2018, it is also hosting the Great Exhibition of the North later this year. We had such a great time. Look out for more blog posts of things to do in this area coming your way. Disclosure: We were invited to stay for two night on a complimentary basis in order for us to review the luxury lodges, in return for an honest review. All photography is our own. To be kept up to date with events, new openings, recipes, things to do and child-friendly places to take the kids, plus giveaways then follow My Boys Club on Facebook, Instagram or Twitter too. Or why not pin this on Pinterest? Those little huts look so cute! I'd love to stay in one of them.